If the grinding roller turns with difficulty, the capacity will be reduced and output size will be worse. 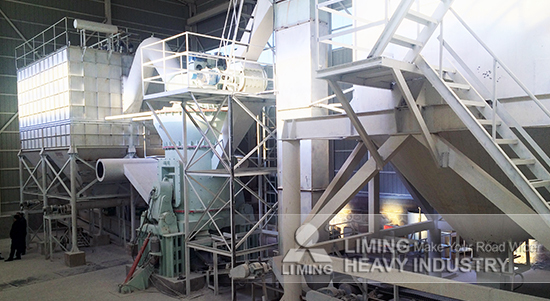 So what’s the factors influencing roller rotation of slag mill. When slag mill works with high speed, grinding roller will be driven by suspension shaft, and suspension shaft starts to work because sliding bearing is rotating driven by motor. In a word, sliding bearing of suspension shaft will influence roller rotation of slag mill to a great extent. If grinding roller can’t turn flexibly, you should check if there is problem in sliding bearing. When dust falls on the sliding bearing of suspension shaft, there will be greasy dirt because lubricating oil is mixed with dust, and then lubricating oil can’t lubricate any more which makes friction between bearings increased and rotation of grinding roller slow. If you don’t clean greasy dirt in time, it will result in lock between sliding bearing and suspension shaft, and then grinding roller can’t work and motor will be burnt out. Sometimes lack of oil also influences the rotation. Besides, damaged bearing will effect the result, too. When slag mill works, if there is big slag going into grinding roller and grinding ring, these two parts will be damaged even clearance is enlarged. In this situation, grinding roller will sometimes work or sometimes not work, so slag can’t be processed effectively, and then the efficiency and capacity will be influenced. <<Previous：How much is HPT300 Hydraulic Cone Crusher? <<Next：How much does it cost for slag vertical mill production line with 300 thousand tons per year?